Over the 2017-18 season, two students proposed a concept which was very well received. 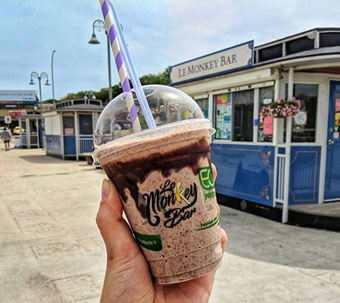 Le Monkey Bar was born offering healthy, natural concoctions that nourish the body and soul. Capitalizing on the fact that hundreds of people walk, jog or stroll by, sight-seeing or exercising, the duo aggressively put their acquired business knowledge to the test. Opened on the Victoria Day weekend and operating throughout the summer months up to and including the Labor Day weekend, the students were offered guidance through the CDEM, their professor and Entreprises Riel. Invariably, students rave of the opportunity provided to them through this practicum. Their project was considered very successful, so much so, that the duo undertook a second season in 2018 while testing new products, with the intention of eventually opening a permanent location.